Orioles are medium sized song birds possessing a lively combination of blazing orange, yellow and black feathers. Orioles prefer wooded habitats, tree orchards, and yards with shade trees. They can be found across the Eastern US and Canada and most winter in Central and South America. Nine species of orioles occur in the United States. The most common being the Baltimore Oriole which occurs mostly in the eastern United States and the Bullock's Oriole which occurs mostly in the western United States. Their ranges do overlap. Most orioles do not winter in the United States but arrive for the nesting season in April and May. The diet of an oriole consists of flower nectar, many types of fruit, some nuts, and also insects. 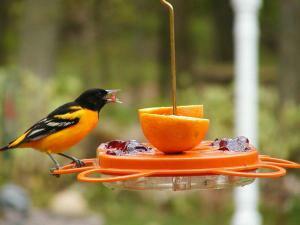 Attracting orioles usually means placing an oriole feeder in your yard or garden. Many people have been successfully attracting orioles by offering fruits like orange slices, grapes, cherries, various berries, figs, nuts and jellies. The fruit can be offered on a simple platform feeder and jellies can be placed in a flat dish. Mealworms are also readily taken by orioles. They can be purchased at most local sporting or fishing stores where they are sold for bait. Mealworms are insects, not really worms. The mealworm is the larval form of the beetle. They make excellent food for orioles and other birds. Small straight edged cans or empty plastic containers which are at least 2-3 inches high can be used to hold the mealworms and prevent them from escaping. The container can be placed on the platform feeder that contains the fruit. In addition, Orioles also love to have a sugary water solution available. This mixture closely resembles flower nectar. Nectar feeders for orioles are very similar to hummingbird feeders and should be placed near the platform feeder. The oriole nectar feeder normally is colored orange. Orange seems to be best for attracting oriole species. Thus, the perfect oriole feeder station should be able to offer fruit, a sugar water solution holder, containers for mealworms, and containers for offering jellies. These feeders can be home-made or can be purchased. Your feeding station should be about seven feet off of the ground. Birds need water to avoid dehydration and to maintain health. They are attracted to shallow dishes of water which provides them a place to drink and bathe. Bird baths are probably the best way to attract birds to your yard, even more so than feeders. Clean water is often the most difficult resource that birds must locate in order to survive. They use the water for not only drinking, but also for bathing which can cool their bodies during the heat of summer. Having water available is especially important in times of drought when birds may be stressed. If you can combine water, the appropriate food, shrubs and trees, and maybe even nesting boxes, your opportunity to attract wild birds will be greatly enhanced.